Molly Leigh is most remembered for her most conspicuous lifestyle, her bizarre actions led to her being labelled a witch. From birth, Molly was ‘unusual’, story tells that she could eat solid food from only a few days old and her appearance was quite unique. Her eye defect helped spread her story far and wide in Burslem. In the 17th century people were discriminated on how they looked, so unfortunately anyone different like Molly Leigh was labelled an outcast. As she was growing up, Molly Leigh was a difficult child that roamed on her own. Due to being rejected by the villagers she was shunned into an isolated part of Burslem away from the town but rumours about her cottage still spread. Her never-blossoming hawthorn bush added more suspicion on whether she was a witch. As well as that her blackbird was said to terrorize the village, one famous story includes her blackbird circling the local bar, the Turk’s head. Following the appearance of the blackbird, all the beer in the pub turned sour, much to the upset of one villager. That particular villager was Reverend Spencer, the very person that accused Molly of being a witch in the first place due to the fact; she failed to visit the church on a regular basis, an uncommon act to do at the time. But the hatred may be due to the fact that Molly accused the Reverend of being a drunk. This enmity may be the reason that the whole village turned against her. Although, Molly was accused of being a witch, Reverend Spencer still buried her in the churchyard of Saint John’s church; no witch would ever be buried in a holy place. And Molly's story gets even more intriguing after her death. As legend goes, Molly's blackbird began to terrorize the locals; the villagers came to the assumption that Molly's soul had been implanted into her only companion, her bird. Furthermore, several drunken villagers visited the cottage after her death and to their surprise; they saw Molly sitting on her rocking chair. Was it the effect of the drink playing on their mind or did they really see Molly's ghost? But to put the villager's mind to rest, one final task was performed to put Molly Leigh's soul to rest, a unique procedure only ever performed on Molly Leigh. Her tomb was opened by Reverend Spencer and she was reburied in the opposite direction and with her blackbird that was still alive, Molly Leigh was laid to rest in peace. 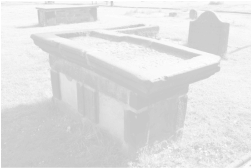 Yet, her story continues today, the people of Stoke circle her tomb every Halloween, chanting 'Molly Leigh, Molly Leigh, you can't catch me.' Whether Molly Leigh was really a witch or not is unknown but her presence has definitely imprinted into the history of stoke, a true legend.